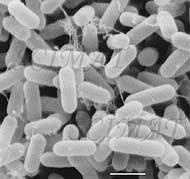 Listeria monocytogenes is a Gram-positive bacterium, which may be isolated from soil, animals, birds, plants - and also from contaminated foods. This bacterium is very resistant to environmental conditions and grows even at low temperatures used in home refrigerators. It is the causative agent of food poisoning called "listeriosis", which has recently been recognized as an important public health problem in the United States. Food poisoning (foodborne illness) develops when a person consumes food contaminated with pathogenic bacteria, viruses or parasites. This latter link also provides advice on how to avoid food poisoning. Chemical modification of a milk protein called lactoferrin gives it a property to kill food pathogens such as Listeria monocytogenes and Pseudomonas fluorescens. photographed under a scanning electron microscope by the author.